Our production facility produces the Templetuohy Farm Fresh range of meats and ready to cook products, about 50 lines in total. In 2010 we saw the need to supply a superior range of quality products to meet consumer demand. We are regulated by a Veterinary Inspector appointed by the Food Safety Authority of Ireland. These inspections are regular and unannounced. Chicken; Our Chicken is exclusively produced by Carton Bros. (Manor Farm) in Co.Cavan. All this Chicken is Certified Bord Bia Quality Assured Irish Chicken. 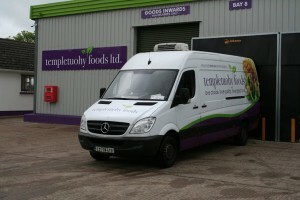 In 2011 Templetuohy Foods sold approximately 700,000 Irish Chickens, helping to support Irish Farmers and Irish Jobs. Beef and Lamb; Our Quality Assured Beef and Lamb is supplied by Dawn Meats, and we also purchase Beef and Lamb from a local abattoir, Tynan meats in Johnstown, Co Kilkenny.Pork and Bacon; Our Pork and Bacon is exclusively supplied by McCarrens from Longford. All this product is Bord Bia Quality assured Irish Product using traditional curing methods ensuring great taste in the traditional way. Our sausages are produced by Loughnane’s of Galway and we are agents for Una O’Dwyer’s Artisan-produced Sausages, Speciality Sausages and Puddings. We are also agents for Truly Irish Sausages, Rashers and Puddings. We place a huge emphasis on providing a quality product at quality prices, ensuring our Customers have a satisfying culinary experience. We aim to continue to support Irish producers and bring quality Irish produce to our customers in order to secure our continued success in these trying times. Kevin & Miriam Everard started the company in 1993. Our aim and objective to produce top quality products at competitive price’s to a select market. We have grown steadily to become one of the largest food distributors in Ireland.